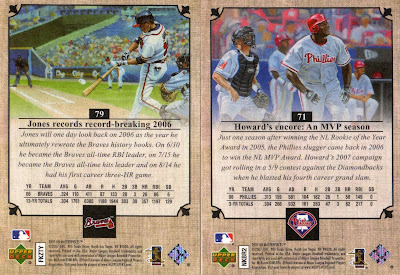 Upper Deck did a nice turn in 2007 with these pastoral, brushed-up cards. Available in slim packs of 4 (corrected from 6), UD Masterpieces captured memorable moments on roughened, canvas-like stock with gold foil framing. Loaded with parallels and other inserts as modern sets often are, I see its artful look as competing with Topps' 2006 resurrection of Allen & Ginter. 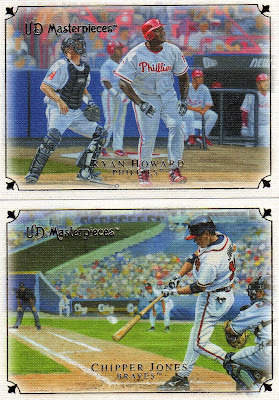 My handful of cards came from a Wal-Mart repack, but I enjoyed the artistic style enough to consider buying more. (As a 99% vintage collector, not many current-day sets grab my attention.) People willing to pony up for a hobby box can score unusual cards like 5"x7" inserts, black borders, and other curiosities. Back in 2007, A Pack A Day blogged their box break live and included a number of nice scans; the affecting "Lou Gehrig Day" is my favorite. OK, there's one obvious weakness, the repeated back photos. I assume the painting "treatment" came from a reusable series of Photoshop filters, so why not pick out a nice player profile shot and run them again? Adding more variety would nail it and could even be superior to A&G's "foggy nostalgia" look. UPDATE: As noted in the comments, I assumed incorrectly--the pictures used are real paintings and thus closer to "art" than one might suspect. What to do about the backs, then? They still seem unnecessarily repetitive. How about a painting of the home park for all members of a given team? eBay search for "2007 UD Masterpieces"